When Sharps reached out to me to review the Relia-Bolt, I had that skeptical look across my face. Instantly I had this image in my head. “Uhh, you angled the bolt lugs and are using different steel to improve reliability? my eyes squinted attempting to imagine the design…OK yeah I am going to have to see this thing, because I am not getting it.” In the back of my head I started asking the question was this a solution looking for a problem or a solution to a real issue. The answer is that is depends on you, your rifle and the environment which you work in. Sharps Rifles are a household name in the gun industry with manufacturing that dates back to 1840 and accuracy that delivered some of the first truly accurate 1000-yard firearms. On the consumers side, Sharps is well known for Tom Selleck's use of a Sharps rifle in the movie Quigley Down Under. Today Sharps is part of the Broadsword sporting group which includes Sharps Rifle Company, A-Square, SRC Arms, H.H. Heiser, and Merwin Hulbert. Most of those other divisions are more famous for their engineering and manufacturing than firearms/related parts. The combined resources deliver a lot of capabilities and engineering ranging from production to custom. In this case, the company collaboration delivered a new way of thinking about a 100% compatible AR15 Bolt design. Why an AR15 part from a set of companies most famous for a old-time long range rifle? Simple. SRC Arms is in the process of launching a line of AR15 hunting/sporting rifles chambered in their newly developed 25-45 Sharps round based on the .223 with a heavier larger round flatter shooting than the 300 Blackout. In the course of the development of their rifle line they began to ask why not also develop a better AR15 bolt. The Relia-Bolt is intended for all AR15s. The bolt is compatible with the 25-45 Sharps or any .223 case based round such as 300 Blackout and 5.56 Nato/.223 Remington. Many things about the AR15 format have evolved and improved since its first introduction. Free float forends, adjustable gas blocks, coating and material technology improvements, new stock and buffer tube lengths, spring rate and buffer weight changes, triggers, sights, optics, new carrier designs and lightweight option... and the list goes on of things Mr Stoner never predicted. What has not changed since introduction is the bolt design. There are a few people out there like Barnes Precision, JP, and YM who are making design and steel enhancements, however fundamentally the Bolt design has remained unchanged. After I receiver the Sharps Relia-Bolt, I had an ah-ha moment where I understood the features. The NP3 coating (hardened Teflon) adds lubricity, self-cleaning, and longer part life and the upgrade to S7 steel improves tensile strength by 75% and yield strength by 60% over the industry standard premium Carpenter 158 steel. You need the added strength if you are going to fiddle around with the bolt lug profiles which took a bit of hands-on simulation to understand. The standard $65 AR15 bolt available anywhere is essentially a non-optimal squares on squares engagement that requires near perfect alignment to work. Luckily the original Stoner design assures that in most cases the bolt will turn clockwise to unlock from the barrel extension lugs and the top of the cam will be held in unlocked position throughout the cycle by a groove in the upper receiver, the BCG cycles, picks up another round and relocks with a counter-clockwise twist after clearing the barrel extension lugs about the same time the top of the cam pin can move over in the can pin rotation recess in the upper receiver. Ultimately this is what is supposed to happen, however in extreme situations, grit, grime and wear to the cam pin, receiver, and piston rings can throw everything off and cause problems. 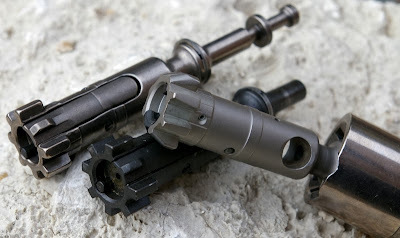 Sharps obviously advocates proper gun maintenance and inspection to avoid and prevent the issues causing operational failure, however there are situations where high rate sustained fire, environmental issues, excessive receiver or cam pin wear/damage, and maintenance are not possible and that is where the Relia-Bolt will continue to operate. Grit and grime can build up at the bolt and barrel extension union to the point where the bolt is not locking or engaging fully. With either extreme cleaning neglect or very hard use conditions the bolt may not be able to fully lock due to the crap stuck in the chamber or bolt/extension lugs. Sharps Relia-Bolt answer to this problem is deliver a self-lubricating and, for the most part, self-cleaning design. The bolt is coated with NP3 which for all practical purposes is hardened Teflon and is essentially self-cleaning which can literally be cleaned by wiping with a soft cloth. The tapered leading edges of the bolt lugs in theory also help to plow through buildup around the barrel extension lugs which could occur during extreme neglectful maintenance or situation where a high amount of debris may have found its way into the chamber area. In a normal working state, the bolt is held in an un-locked position for the length of the cycle by the upper receiver capturing the cam pin so the bolt cannot accidentally lock mid-cycle or as it picks up another round. There is a notch in the upper receiver which is "timed" to allow the cam pin to rotate to a locked position after the bolt lugs have passed and entered the barrel extension lugs. 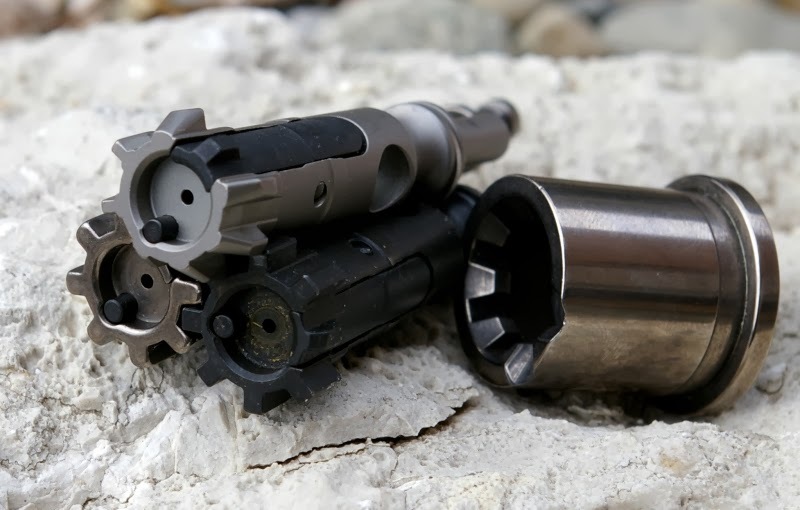 However a severely worn upper or cam pin can create a situation where the bolt can partially start its counter-clockwise locking cycle just from the pressure of picking up a round or a sticky round in the magazine. 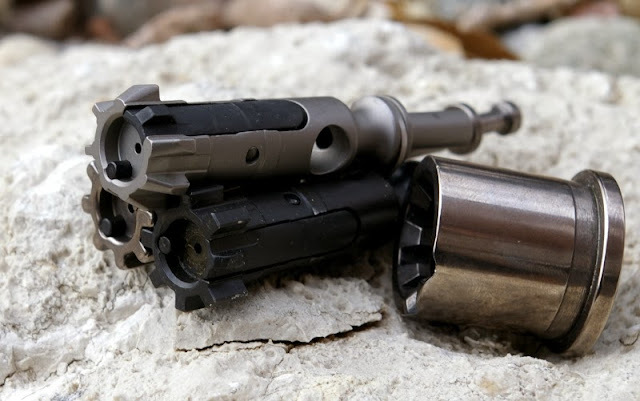 When this happens the clocking/timing is off on the bolt and the lugs on the bolt and barrel extension collide versus interlocking, thus preventing lockup. The Sharps solution is to taper both the front leading edges and the left counter-clockwise facing edges of the lugs. This directional wedge effect drives through chamber buildup and will drive the bolt face back clockwise slightly back to an unlocked position to engage the barrel extensions without jamming. Sharps decided to stay with a standard Carpenter 158 steel extractor simply because the benefits of the S7 steel are minimized to that of the standard Carpenter steel during extractor final heat treatment. Additionally there was a perception that a NP3 coated extracter would be too slick and actually decrease reliability. According to testing that was not the case, however the perception was there so inevitably Sharps decided on a standard premium extractor. The Sharps Relia-Bolt is an extreme performance/environment upgrade. In ten of thousands of rounds in over thirty tested AR15s, I have never had a chamber area get so dirty or cam/receiver wear so severe to create the jam situation resolved by the Relia-Bolt’s angled lug face. I do believe the lubricity, durability, and cleaning of finishes such as Nickel Boron and this NP3 (hardened Teflon) treated have improved functioning on rifles I have tested. Bolts with these coatings have been shown to run longer, smoother, cleaner, more reliability, and some claim lubrication-free. The NP3 coating is what I believe is the most attractive feature, however bolt breakage does occur and the stronger overall bolt design through the use of S7 steel could prevent bolt breakage. Bolt breakage is far more likely a failure than an out of time bolt jam. I did simulate the jam the patented Relia-Bolt design could prevent. To do this, I pulled the cam pin out of a carrier and simulated the overclocking issue and the Relia-Bolt clocked back into position where the standard bolt jammed. In short, things would have to be going horribly wrong with a severe amount of wear on the receiver cam pin channel and/or the cam pin itself for the lug tapers Sharps Relia-Bolt to be used. I can see where extreme environment, a long-term fielded AR15/M4, and/or extremely neglected ARs could develop enough slop so I term the Relia-Bolt as a “extreme performance/environment upgrade”. It may sound like I am saying the Relia-Bolt is a solution looking for a problem, however I look at it a bit differently. Its an upgrade that can only improve reliability with the MP3 coating and decrease maintenance and in a worst case situation still deliver functionality. Upgrading your AR15 bolt to the Sharps Relia-Bolt delivers another layer of reliability just as we all now swear by chrome, nitriding, nickel boron, and NP3 to deliver longer running, smoother, cleaner, more reliable, corrosion resistance, and lower lubrication requirements bolts over standard Mil-Spec phosphated bolts and the S7 steel is stronger as well. It is doubtful I will ever drive an AR hard enough with such a high level of neglect to utilize the Relia-Bolt’s leading edge lug tapers however the Sharps Relia-Bolt still offers the top end of slick, cleaner, longer running, more reliable, corrosion resistance, and lower lubrication bolt design that is still at least 60% stronger than a standard AR15 Bolt. With a lifetime warranty and those specs it is the most sophisticated AR15 bolt available. For those looking for the ultimate in bolt design, the Relia-Bolt could deliver the extra bit of reliability when you need it most. Relia Bolt is drop-in compatible with all existing .223/5.56 variant parts groups and bolt carriers. No modification or tools are required for installation. Also works with all .223 cased variants - 300 Blackout, 25-45 Sharps, ...etc. The Relia-Bolt is machined from S7 tool steel, which significantly increases its strength. When compared to mil spec Carpenter 158, the S7 steel provides a 75% increase in tensile strength, and 60% improvement in yield strength. Every Relia-Bolt is coated with NP3, an electrodes nickels-based finish that co-deposits sub-micron particles of PTFE (polytetrafluoroethylene), commonly known as Teflon. Even after thousands of rounds without cleaning, carbon residue can be wiped away with a soft cloth. Lifetime Warranty - The LW for the SRC Relia-Bolt covers defects in materials and workmanship, all parts and labor to repair or replace defective products and return shipment within the continental United States. Aero Precision Upper Lower Review - Who is AP?